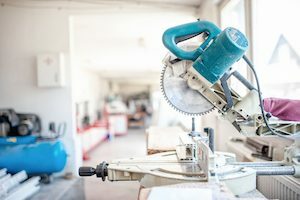 Found on just about every job site and tool room is some sort of circular saw – with the two most common being the chop and miter models. While similar in form and having many of the same features, these saws have distinct niches they work better in. When it comes to picking a device that works great for you there are a few things you need to consider first. In the next 10 seconds, this Chop Saw vs Miter Saw comparison chart and buying guide will give you the information you need to make an informed buying decision. Ideal for cutting steel and stone. Uses circular blade instead of abrasive wheel. 10 Second Summary: The main difference between a chop saw and a miter saw is that the chop saw cuts straight down in 90-degree cuts while the miter saw can be rotated to cut angles and tilted for bevel cuts. Note: sanding and drilling equipment produce fine particles that are harmful to breathe and may cause cancer. Use proper eye, ear and nose protection when performing these tasks. Make sure that there are no bent, fraying, or broken parts on your machine before you operate it. Using the right parts is remarkably important to – make sure things like the cutting blade are the proper size and speed rating. Regardless of all the safety gizmos that your saw might have you should still invest and use things like safety glasses. The guard should always be extended when the machine is in use. A chop saw, also referred to as a cut-off saw or abrasive saw has a stationary base and a cutting disc that swivels downwards on a hinged arm. 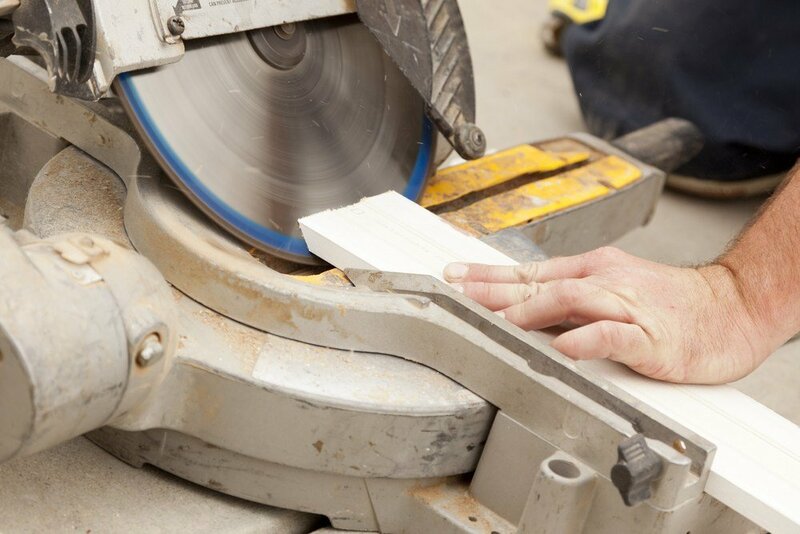 Instead of using a sawblade, the chop saw often uses abrasive discs known as cutoff wheels. 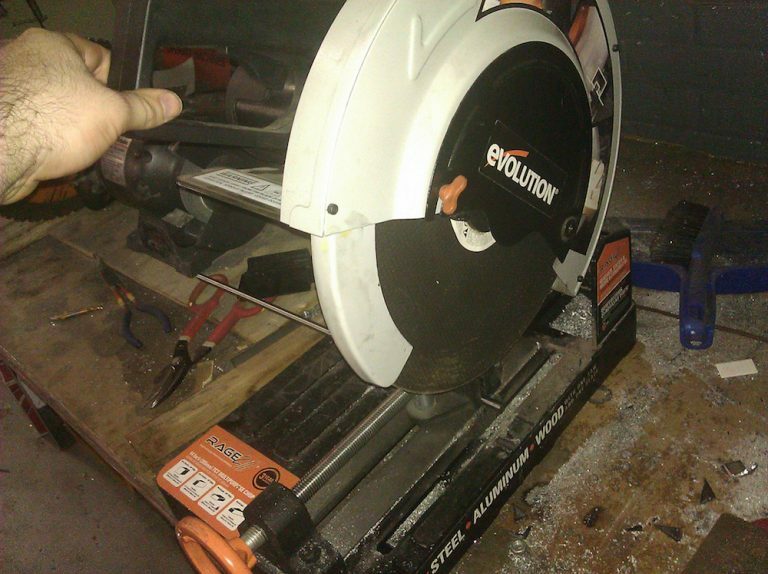 You can often add a blade to a chop saw, but that isn’t their intended function. The saws are primarily used for crosscuts on steel. Miter saws, often confused for chop saws, have a few key differences and are designed to cut wood instead of metal. While they are notable for having a heavy base to cut on and a hinge mechanism that brings the blade down to the wood, it can also pivot at multiple degree angles and provide bevel cuts. Sliding miter saws are also able to make cuts in wider pieces of wood. A miter saw works by pushing a piece of material up against the fence. In the default position, this saw cuts at a 90° angle but can be modified to other angles as well. While one degree or even half-degree increments are possible, many models incorporate quick set stops for common angles such as 15°, 22.5°, 30°, and 45° to name a few. This tool is often used by carpenters and other home improvement specialists that deal with wood. Some miter saws can only cut the blade width of the wood, but a sliding miter saw is able to make longer cross cuts of around 11 1/2″ , thanks to the sliding action of the saw. 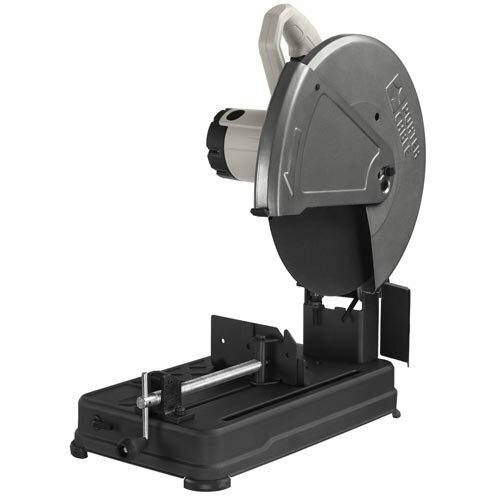 Miter saws are excellent power tools for cutting wood, PVC, aluminum and thin metals. One of the upgrades that the 4000 offers is a separate on/off toggle switch. This allows you to turn off the tool instantly, and yet be able to flip it back on and immediately pick up back at the same speed. The other neat switch feature is that the 4000 has a spin dial that allows you to dial in the correct speed. The Electronic Feedback Control seems to allow it to offer a little more torque at lower speeds. The 3000 only has 5 pre-set speed control settings from which to choose. It also struggles with underperforming at the lower speeds, forcing you to choose a higher RPM (which lowers precision on some tasks). Both a chop and miter saw can be considered a circular saw, but you better believe they aren’t the only of their kind. Instead of using the abrasive disk of normal chop saws, a cold cut saw relies on a metal blade with a tungsten carbide tips. Cold cut saws are able to keep the temperature of the blade and the material it is cutting at a minimum. This gives them the advantage of creating fewer sparks, less discoloration, and accumulate less dust. An industrial chop saw is much larger and even more powerful than their residential counterparts. Typically composed of a large base that extends off the ground, these machines have a heavy casting that reduces vibration. These machines are often used for larger jobs. These impressive machines use a combustion engine in place of an electrical one. Being portable, these devices are used onsite to slash through concrete, cement, and other tough stone that can’t be moved. The powerful 15 Amp motor fires up for a maximum of 5.5 horsepower – allowing it to cut through just about anything you can throw at it! Composed of a combination of plastic and metal means that while this machine it is tough it is remarkably heavy – while no means a portable model it can be moved around a bit easier than others of the same size. The blade itself uses abrasive disks that can cut through most pieces of metal with little problem. It also has a quick change system that gives you the ability to swiftly extradite the old blade and replace it with a new one. The blade itself can be angled to give different degree cuts – anywhere from 0° to 45°. The only issue is that there is no locking feature for common cuts – this means that you’ll need to adjust the machine before every cut. Thankfully this adjustment only takes a couple of seconds and it makes sure that you’re always paying attention. This Porter-Cable machine is for those that want something that’ll get the job done without any of the nonsense. Using a traditional 120-volt outlet gives it 15 amps of power to get the engine up to 3,800 RPMs. You can be sure that your cuts are always good too with the tough material clamp that has a quick-release function. The fence along the back of the cutting area can be adjusted to give you a customized cut. This saw has been lightly criticized for being a little bit on the smaller side, making it not so viable for more industrial applications. That being said, when it comes for an excellent saw for the garage you can’t really go wrong with this model. The base is extra heavy duty so stability will never be an issue. The handle is ergonomically designed to be easy to use, while the deflector protects against any unnecessary sparks flying back in your face when cuttiing. 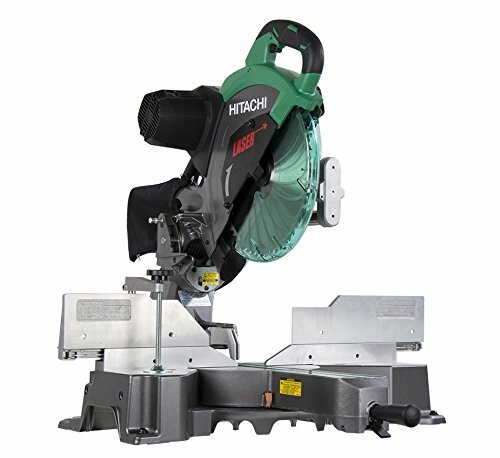 Hitachi has always been a brand of remarkable caliber and this sliding dual-bevel compound miter saw is no exception. This 2.57 horsepower machine has 0° to 57° miter angle range that can be modified either to the left or the right. Using a 15 Amp motor to cut through even large jobs, it offers a laser guide to keep you on track. It includes a vise assembly for holding bigger pieces and the sliding fence allows you to cut up to 7 1/2″ crown molding vertically. Since it is a dual bevel saw it can perform left and right bevel cuts on the same side, making this saw ideal for those who need to frequently perform compound cuts. 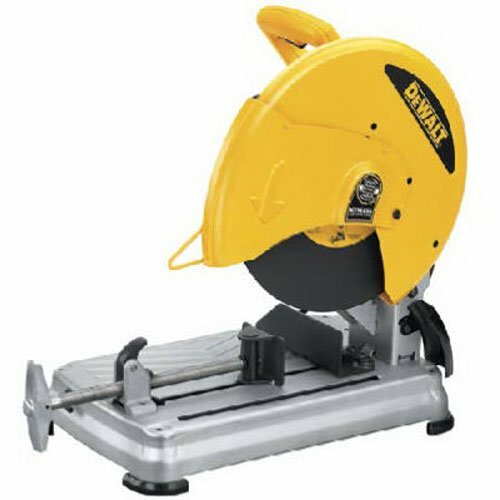 The 12-inch blade and sliding mechanism make this one the ultimate choice for your woodworking projects. It is highly likely that you will find yourself using this for a lot more cuts than you thought you initially wood. It works great for finish and trim carpenters because of its amazing precision cuts. This miter saw is able to better facilitate this with a horizontal handle which allows for quick, yet accurate cuts every time. This is one of the most versatile woodworking tools for extensive DIY projects and for the contractor who needs to make a lot of wide, bevel, cuts. Want a machine with impressive power and accurate cutting capabilities? 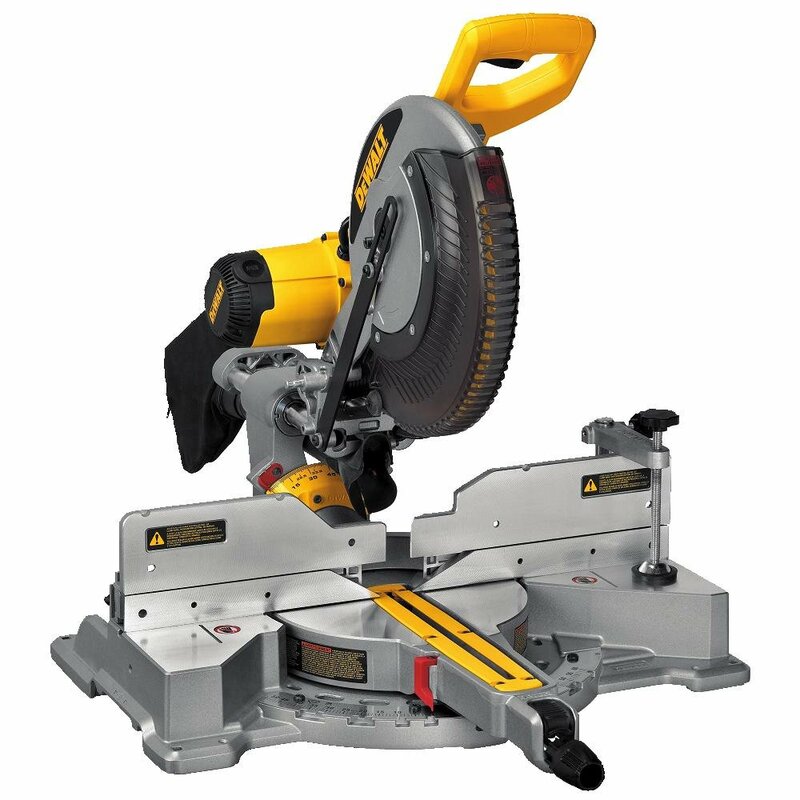 Then look no further than this Dewalt miter saw. With an impressive 15 Amp, 3,800 RPM motor means that few pieces of wood will give you any problem. The fence along the back can slide, letting you adjust as necessary – meaning that everything from small pieces of trim to larger 2”x4”s can be cut with accuracy. When it comes to angle cuts you have a range of 60° to the right and 50° to the left. While not a huge machine, it does have a weight of around 51 pounds. There are many lighter models on the market making this machine not the first choice in maneuverability. Thankfully this weight isn’t unnecessary, as Dewalt has outfitted this 12 inch miter saw with a lot of power and gadgets to more than make-up for its cumbersome weight. The angle miter adjustments have 13 detents, allowing you fast adjustment to commonly used angles. The circular saw is one of the most versatile tools sitting in your worktruck. With some creativity and carefulness, they can be used to cut brick. For heavy masonry work and for cutting steel, I’d still advise getting a chop saw. The Miter saw can be used to cut thin steel and aluminum. But it isn’t recommended. Chop saws are better sealed to prevent the metal shavings from entering the motor housing and ruining the blade. The saws also lack the durability for high-resistance cutting. There is high probability of ruining your miter saw if you use it for metal work. The table saw contains a small circular blade tucked into the center. Cube-like in shape, it contains many of the same features as other circular saws such as guides, angle adjustments, and a dust collector. In theory, a chop saw can be used to cut thin metal, but the risk of dangerous kickback is very high. Additionally sparks can set wood shavings on fire, so clean the table saw thoroughly. It is not recommended to use a table saw to cut metal. 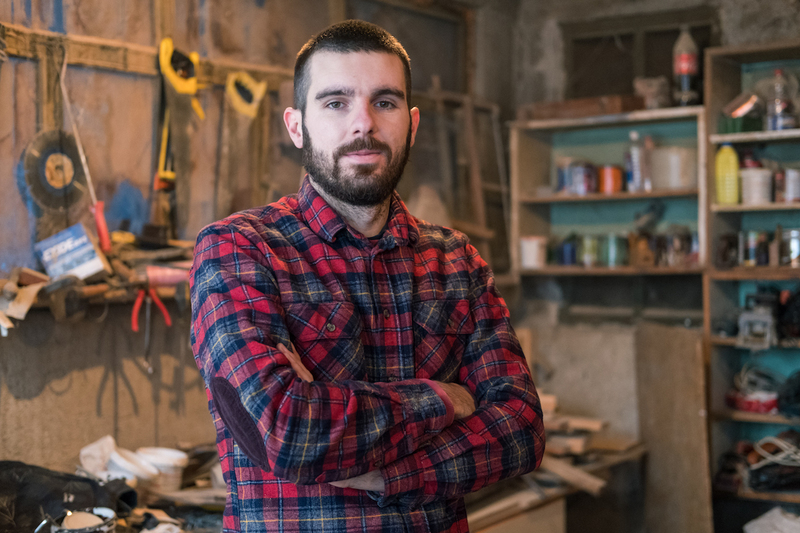 Roughly speaking, a chop saw is built to cut through most metals and stone, while a miter saw is better for wood projects. You really need to get a separate one for each task type. 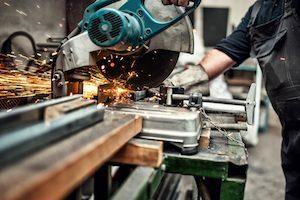 Regardless of your pick, you should get a machine that has a solid base, capable of adjustment and has a guard to block dust and sparks from getting into your eyes.